Claxton Castle survives as a series of earthworks and one large wall with five remaining bastions. Part of the entrance gateway also survives including portcullis grooves. The earthworks show that the castle was a complex structure incorporating an inner moat and a possible outer ditched enclosure. In the late 16th or early 17th century a mansion with a porch tower was built at right angles to the remaining castle wall. 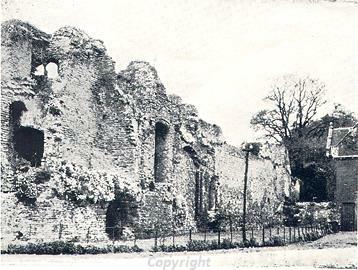 This was demolished and replaced with Claxton Manor in the 17th century incorporating the porch tower. Later extensions and renovations through the 17th and 19th century included the addition of the south pile. Excavations in advance of the building of a swimming pool have revealed more of the castle gatehouse and castle walls. Castellated 1333 by William de Kerdiston. Wall about 40m (130 foot) long with six bastions - one partly destroyed in recent times. Isolated pier on northeast probably part of east façade or entrance gates. Faint traces of portcullis grooves. (These remains alone are scheduled). In De La Pole and Robsart ownership. Part of precinct wall remains on north, and portion of a two-storeyed hall on the north side of the south wall. Large moated bailey. (S4) states that part of present Manor House is of 1564; but mostly 17th century, with shaped gables, and 19th century façade. Barn is dated 1706. (S5) say inner moat is original but outer is only a drainage ditch. This however is disputable. 1977. Found in building swimming pool on probable line of inner defensive ditch at TG 3355 0378. Sherd of 15th century imported German stoneware. Non-scheduled buildings are listed Grade II 1986. (S6) describes the Manor as 17th century, much altered 19th. Flint and red brick, tiled and pantiled roofs.Two storeys, attics in part, part double pile. 19th century south façade five bays symmetrical; central two storeyed porch; stone surrounds to windows and doors. Earlier range at rear has 19th century casements in mullioned and transomed openings, and large capped external stack at north-east corner. Two stacks on north wall. Shaped east gable; ground floor window in large arched opening, spandrelled; first floor window has rebuilt pediment. Barn is dated 1706 with 'R P'; red brick and thatch; base of south gable flint and stone. Parapet gables with moulded corbels and platband. Vent loops in south gable, two pairs double doors to west flanked by brick pilasters; east side has two gabled projections with double doors. Report by source  in file suggests that there are ringworks to north and south of main castle, partly incorporating the large outer moat formerly shown by (S5). He also suggests other earthworks and enclosures around. The 'south ringwork' is also stated to have been noted by a student of source . B.Cushion (NLA) has visited the area marked as Subsidiary Moat 2 to southeast and found no traces of earthworks; decision on the other suggested areas has therefore been deferred for further investigation. E. Rose (NLA), 22 September 1995. Further inspection, full earthwork survey now carried out. The proposed ringworks were not confirmed but a number of unusual earthworks were noted, some possibly cultivation traces. E. Rose (NLA), 14 November 1996. Evaluation excavation at east end of site produced only recent material and animal burrows. E. Rose (NLA), 10 September 1997. Schedule, press cuttings in file. Detailed examination of Claxton Manor revealed that 19th century south pile added to a building of about 1700 altered at the same time. The east end of this earlier build appears more early 17th century than 16th century but looks like a porch tower, suggesting that the original building was at right angles to castle wall. Inside is 16th century fireplace apparently reset. Earthworks relating to Claxton Castle are visible on aerial photographs (S12-S19). These remains are centred on TG 3346 0368 although the castle itself is located at TG 3346 0372. The site has been subject to a ground survey (S7) but 1946 aerial photographs (S12) show additional earthworks which no longer survive and have extended the site area. The castle itself was surrounded by an oval moat defining an area of approximately 200m by 100m. The south-east corner of this moat survives as a water-filled feature adjacent to The Street. It appears that at least part of this road deviates around the outer edge of the moat from an otherwise fairly straight course. The east side of the moat was present as an earthwork in 1946 but had been partly filled-in and built over by 1959 (S13). The line of the southern section of the moat is defined by low earthwork banks running across the lawns to the south of the present house. Extant drainage ditches, with associated banks appear to form the western side of the moat. Its northern circuit lies beneath the modern farmyard and is not visible on aerial photographs. There has previously been some confusion about the existence of an outer moat, although its course was marked on the first edition 6 inch to the mile Ordnance Survey map (S11). Its course is fairly clear as earthworks and soil marks on the 1946 aerial photographs (S12) and corresponds well with that suggested Liddiard (S10). The western part of the outer moat survives as a faint earthwork on the lawn of the present house and as a modern drainage ditch to the south of The Street. The central section is the most clearly visible as an earthwork on the aerial photographs and was mapped in (S7). The south-east corner of the outer moat is visible as a broad positive cropmark on the 1946 aerial photographs (S12). It is possible that it continues into the field to the north, but linear agricultural marks make this uncertain. A linear drainage ditch cutting across this field on a roughly south-west to north-east alignment has previously been equated with the continuation of the outer moat or enclosure (S7; No.4). However, aerial photographs indicate that this ditch first appears between 1946 and 1959 (S12-S13). Within the area defined by the outer moat is a roughly triangular earthwork platform and a linear ditch. It is difficult to determine whether these are related to the moat or if they are earlier features. Earthworks to the south-east of the Home Piece Road track had been levelled and ploughed by May 1959 (S13). A south-west to north-east linear bank earthwork is present to the south-west of the outer moat earthworks. This feature extends for 190m and is cut by a track (a continuation of Home Piece Road) which diagonally crosses the area of the earthworks. This has been interpreted as a possible headland and appears to correspond to a boundary shown on the 1819 enclosure map (see S7). The 1946 aerial photographs (S12) appear to show this linear bank forming a right-angled corner at its north-east end and continuing to the south-east along the line of the outer moat as fragments of linear banks. These sections of linear bank could simply relate to the outer moat, but they are not present anywhere else along its visible length. It is possible that the fragments of linear bank along the line of the outer moat and the bank extending to its south-west form part of an earlier enclosure that was cut by the outer moat. Several irregular linear bank and platform earthworks are present within this possible enclosure. The largest of these is located in its south-west corner and measures 72m by 48m. It is possibly a platform for a group of buildings. To its east are two rectangular earthwork platforms associated with linear ditches and an irregular sunken area of possibly natural origin. The area of these platforms was later occupied by a small plantation woodland. All of these earthworks to the south of the outer moat lie in an area identified as a possible park in (S10). If their relationship to the outer moat is correct, they would appear to be earlier than the castle and its park. To the west of the possible enclosure, in the south-west corner of the field is a group of parallel short banks and ditches. They are cut on their western side by a modern field boundary and drainage ditch. They have the appearance of broad ridge and furrow, but their location is possibly too low-lying for medieval agricultural land (S7). Further to the north, close to The Street, is a roughly circular earthwork platform flanked by linear banks and ditches. In addition to the standing masonry remains that are visible on the aerial photographs, very little could be added to the plan of the castle buildings. A single linear cropmark, possibly relating to a wall, was visible on the lawn to the south of the present house (S14). Earthworks of undated linear ditches are present to the north of the castle (S12). --- Article in Serial: Gurney, D. and Penn, K. (eds). 1997. Excavations and Surveys in Norfolk 1996. Norfolk Archaeology. Vol XLII Pt IV pp 547-564. p 550. --- Archive: Clarke, R. R. and NCM Staff. 1933-1973. Norwich Castle Museum Record Card - Medieval. Claxton. <S2> Serial: Blomefield, F.. 1809. An Essay Towards a Topographical History of the County of Norfolk.. Vol X. 375. pp 111-118. <S3> Article in Serial: Rudd, W. R. 1906. Claxton Castle. Norfolk Antiquarian Miscellany. Second Series Pt 1 pp 86-96. <S4> Article in Serial: Cozens-Hardy, B. 1961. Some Norfolk Halls. Norfolk Archaeology. Vol XXXII pp 163-208. p 174. <S5> Archive: Ordnance Survey Staff. 1933-1979?. Ordnance Survey Record Cards. <S6> Scheduling Record: English Heritage. National Heritage List for England. <S7> Monograph: Cushion, B. and Davison, A. 2003. Earthworks of Norfolk. East Anglian Archaeology. No 104. p 92. <S8> Unpublished Document: Penn, K. (NAU). 1997. NAU Report No. 249. Report on the monitoring of groundworks at Claxton Manor Farm, Norfolk..
<S9> Unpublished Document: Rose, E.. 2003. Building Report..
<S10> Monograph: Liddiard, R.. 2000. Landscapes of Lordship: Norman castles and the countryside in medieval Norfolk, 1066-1200.. pp 115-117. <S12> Vertical Aerial Photograph: RAF. 1946. RAF 3G/TUD/UK/70 5295-6 28-FEB-1946 (NMR). <S13> Vertical Aerial Photograph: RAF. 1959. RAF 543/552 (F21) 101-2 12-MAY-1959 (NMR). <S13> Vertical Aerial Photograph: Ordnance Survey. 1887-91. Ordnance Survey first edition 6 inch (1887-1891) Sheet LXXVI.SE. <S14> Vertical Aerial Photograph: Ordnance Survey. 1970. OS/70175 103-4 03-JUN-1970. <S15> Oblique Aerial Photograph: Edwards, D.A. (NLA). 1977. NHER TG 3303D (NLA 45/AJA10) 19-JUL-1977. <S16> Vertical Aerial Photograph: Edwards, D.A. (NLA). 1984. NHER TG 3303E (NLA 150/AWX27) 27-APR-1984. <S17> Oblique Aerial Photograph: Edwards, D.A. (NLA). 1983. NHER TG 3303G-J (NLA 137/ATP15-7) 29-JUL-1983. <S18> Oblique Aerial Photograph: Edwards, D.A. (NLA). 1989. NHER TG 3303K-L (NLA 233/DPC12-3) 04-JUL-1989. <S19> Oblique Aerial Photograph: Edwards, D.A. (NLA). 1996. NHER TG 3303N-P (NLA 368/JCL3-4) 08-JUL-1996.